How does the slot work? Playing for the fun and money is possible depending on your ambitions, experience, and overall betting strategy. Thanks to the coin denomination between €0.01 and €0.50 you can place 1 to 10 coins per line and wager from €0.01 to €50 per round. The main task is clear – combine 2 or more items of the same kind (3+ if we talk about lower-paying ones) and receive some coins. The highest rating of all icons, beautiful Queen Cleopatra pays a maximum of 50.000 coins or €25.000 for a combination of 5 of a kind. Themed icons such as Anubis or Ankh are also highly-regarded and provide the winners with 20 up to 20.000 coins for combinations of 2 to 5 items appeared on an active pay-line. Playing cards from Tens to Aces bring 50 and 1.500 coins to the pay-table. Golden Scarab has a dual nature as it works as both Wild and Scatters substituting all other symbols when land on the reels 3, 4 or 5. Thanks to the Scatter Pay option, you will receive 1x, 10x or 50x total bet for 3, 4 or 5 such items. Moreover, they can trigger the Ancient Egypt Classic Bonus games. What kind of special features can you expect? To enjoy Ancient Egypt Classic Free Spins collect 3+ Golden Scarabs, but before the reels start spinning, pick between 3 chests to boost your bankroll. The Low Award grants 1x your stake, while the High Award crate hides a cash prize ranging from 10 to 500 your total bet. If you opt for classic extra spins, the game will grant 10 rounds at the casino’s expense, and 1 icon will be randomly chosen to act as the Expanding Symbol. During this round, it will cover the entire reel and help you form more winning combinations. Moreover, 3+ extra Scatters lead to 10 additional free spins. Is it possible to play Ancient Egypt Classic on my mobile device? Playing does not require downloading any app on your iPhone or Android because you can play online around the sites powered by Pragmatic Play directly on your mobile device. Ancient Egypt Classic free play is also possible from any device. What is the RTP factor of Ancient Egypt Classic? Officially proved by the Ancient Egypt Classic tutorial RTP stands at 96.13%. Using the Ancient Egypt Classic tips received here, we’re more than sure that you will soon enter the realms packed with shiny coins. Ancient Egypt Classic is a 5-reel 3-row 10-pay line slot machine produced by Pragmatic Play that takes you back in time just as the name implies. The game features players using stylized Wilds, Scatters, Free Spins and Multipliers that leads to the big win of 50.000 coins that equals a static jackpot of €25.000 coins just as the name implies. 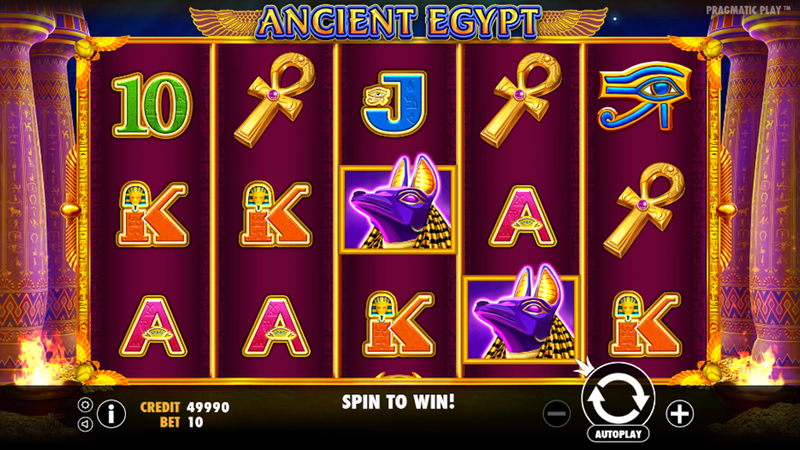 Read the Ancient Egypt Classic slot review and learn how to win.